Clark E. Hinshaw2,11 [Clark Henshaw12,13]. Henshaw, Clark, age 27, born in Indiana; parents born in Indiana; farmer. Henshaw, Lucene, wife, age 23, born in Indiana; father born in Georgia; mother born in Kentucky; keeping house. Henshaw, Ruby, daughter, age 3, born in Indiana; parents born in Indiana. Henshaw, Nellie, daughter, age 6 months, born Dec 1879 in Indiana; parents born in Indiana. Payne, John, laborer, age 20, born in Indiana; parents born in Indiana; works on farm. 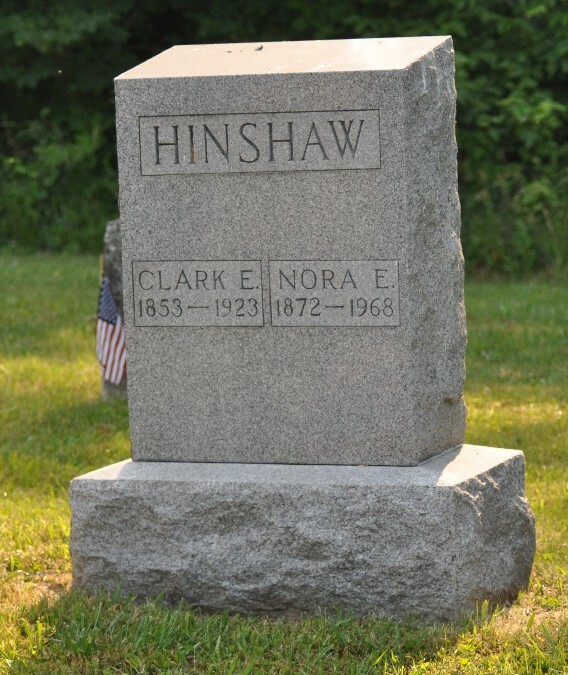 Hinshaw, Clark E., head-of-household, age 47, born May 1853 in Indiana; parents born in Indiana; married 4 years; farmer; owned farm. Hinshaw, Nora, wife, age 29, born Mar 1871 in Indiana; parents born in Indiana; married 4 years; 2 children, 2 living. Hinshaw, William C., son, age 2, born Dec 1897 in Indiana; parents born in Indiana. Hinshaw, Ruth, daughter, age 2 months, born Mar 1900 in Indiana; parents born in Indiana. Taylor, Charles, boarder, age 20, born Aug 1879 in Indiana; mother born in Indiana; single; farm laborer. Clark Hinshaw, wife and child, of Williams, returned to their home Wednesday. Hinshaw, Clark, head-of-household, age 57, born in Indiana; parents born in Indiana; second marriage, married 16 years; occupation: farmer, general farm; owned farm. Hinshaw, Nora, wife, age 38, born in Indiana; parents born in Indiana; first marriage, married 16 years; 6 children, 6 living. Hinshaw, William, son, age 12, born in Indiana; parents born in Indiana; attended school. Hinshaw, Ruth, daughter, age 10, born in Indiana; parents born in Indiana; attended school. Hinshaw, Arthur D., son, age 8, born in Indiana; parents born in Indiana; attended school. Hinshaw, John, son, age 6, born in Indiana; parents born in Indiana; attended school. Hinshaw, Earnest, son, age 5, born in Indiana; parents born in Indiana. Hinshaw, Frank, son, age 3, born in Indiana; parents born in Indiana. Hinshaw, Narah E., wife, age 46, born in Indiana; parents born in Indiana. Hinshaw, Ruth H., daughter, age 19, born in Indiana; parents born in Indiana; attended school. Hinshaw, Arthur D., son, age 18, born in Indiana; parents born in Indiana; attended school. Hinshaw, John M., son, age 16, born in Indiana; parents born in Indiana; attended school. Hinshaw, Earnest E., son, age 14, born in Indiana; parents born in Indiana; attended school. Hinshaw, Frank M., son, age 12, born in Indiana; parents born in Indiana; attended school. Hinshaw, Menerva, mother, age 86, born in Indiana; parents born in Indiana; widow. Hinshaw, Nora, head-of-household, age 57, born in Indiana; father born in North Carolina; mother born in Indiana; widow; owned home ($6000 value); radio in home; occupation: none. Hinshaw, Ruth H., daughter, age 28, born in Indiana; father born in Illinois; mother born in Indiana; single; occupation: book keeper, l[..unclear..]. Hinshaw, Earnest E., son, age 24, born in Indiana; father born in Illinois; mother born in Indiana; single; occupation: mat[..unclear..]man, petroleum co.; not a veteran. Hinshaw, Frank M., son, age 23, born in Indiana; father born in Illinois; mother born in Indiana; single; occupation: clerk, J.C. Penny Co.; not a veteran. Ancestry Family Tree data "ANDERSON-STRAIN FAMILY" posted by "Louis Anderson". 1880 census, District 149, Mitchelltree Township, Martin County, Indiana; roll T9-0298, ED 149, page 271B, line #10, dwelling #166, family #179. 1900 census, Mitchelltree Township, Martin County, Indiana; ED 89, page 116A, line #91, dwelling #317, family #321. 1910 census, Mitchelltree Township, Martin County, Indiana; ED 119, page 114A, line #9, dwelling #293, family #293. 1920 census, Mitchelltree Township, Martin County, Indiana; roll T625-442, ED 147, page 2B, line #64, dwelling #37, family #37. 1930 census, Bedford, Lawrence County, Indiana; roll T626-597, ED 27, page 17A, line #20, dwelling #290, family #304. Ernest Edward Hinshaw marriage license. "Martin County, Indiana Index to Marriage Records A-H Volume 1 1850-1920". 1880 census, District 149, Mitchelltree Township, Martin County, Indiana; roll T9-0298, ED 149, page 271B, line #6, dwelling #165, family #178. 1860 census, Mitcheltree Township, Martin County, Indiana; page 887, line #19, dwelling #904, family #883. 1900 census, Mitchelltree Township, Martin County, Indiana; ED 89, page 113A, line #8, dwelling #235, family #238. The "Bedford Weekly Mail", Dec 7 1900; posted Aug 20 2005 by Diana S. Flynn () to INLAWREN-L.
1910 census, Mitchelltree Township, Martin County, Indiana; ED 119, page 114A, line #17, dwelling #294, family #294.